You probably have gone to the dentist, opened wide, and had an x-ray of your teeth. 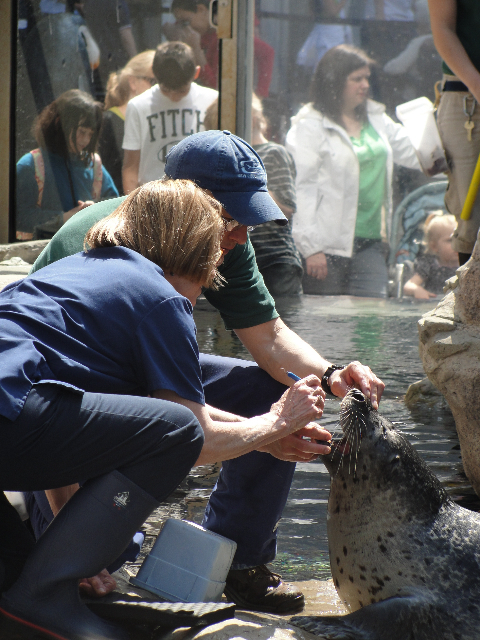 Reggae, 16,has had one,too, and he's a harbor seal at the New England Aquarium! Seems Reggae has a discolored tooth.The problem-how to get Reggae to sit still long enough to get a film inside his mouth. As with all the seals at the facility, trainers had to teach the seals to open their mouths so they could get their teeth regularly brushed. It took an two extra months to teach Reggae(using his favorite snacks-squid, smelt and herring treat)to get Reggae used to the idea of placing a digital film block inside his mouth so the exam could be done. Using a hand-held digital X-ray device,veterinarian dentist Dr. Laura LeVan, got the images, to determine just what is wrong with Reggae's lower canine. 1. Can you explain to young people what a job as a Veterinarian Dentist is? A Veterinary Dentist is a graduate veterinarian who has specialized in dentistry on animals. A veterinary dentist might treat a dog with a fractured tooth with a root canal, a cat for oral cancer, a horse with an abscessed tooth, a seal for a discolored toothand,or a polar bear who has difficulty eating.Dr. LeVan has also done an extraction on a kangaroo, has worked on a bob cat, jaguar, colobus monkey,African Wild Dog. and snow leopard. The best part of my job is knowing that I can make the life of an animal better by giving it a healthy and comfortable mouth.Dr. LeVan remembers helping a laughing hyena that had stopped laughing until she did some extractions and periodontal work. The handler called after the treatment and Dr. Le Van could hear a happy hyena in the background, laughing loudly! She also helped a colobus monkey named Ernie that the zoo considered putting to sleep as it had stopped eating and wasn't doing well. Seems it had a severe case of gingival tissue. Once removed, Earnie was happy and started eating once again! One difficult aspect is that my patients cannot talk to me;I must diagnose conditions from their behavior. I remember a dog that woke his owner up every night, pacing. The owner thought the dog needed to go to the bathroom, so would let him outside. It turned out the dog had a fractured tooth that needed a root canal and was pacing because he was in pain. Once the tooth was treated, the dog slept through the night. This is an example of why it is important to examine your own pet and train it to allow you to things such as brush it's teeth. 5. What are the necessary skills/degrees needed to become a Veterinarian Dentist? A Veterinary Dentist has graduated from veterinary school and specialized in dentistry. This means he or she has done 3-6 years training beyond veterinary school(an internship and residency) and then passed a specialty examination to become board certified in veterinary dentistry. Although a veterinarian enjoys animals, an interest in people and ability to communicate well with people is also important since our patients cannot "speak" to us. 6. Any suggestions for young people who might be interested in your career choice? How can they begin now to get prepared for your career? Young people who think they might be interested in veterinary dentistry should visit a veterinarian and also a general dentist. Science and math, communication skills and, of course, a love for animals are also important skills to develop if you wish to enter the field. Study hard and do your very best in school. 7. Describe a typical day at your job. What specific dental procedures have you done on animals? Which has been the hardest to do? There is no such thing as a typical day for a veterinary dentist. There are many conditions that we examine and treat. In general, there are 6 main disciplines in veterinary dentistry: 1)periodontics concerns conditions of the tissues around the teeth such as the bone and gums; 2)endodontics is the treatment of the internal structure of the teeth-performing root canals; 3)exodontics involves tooth extraction; 4) restorative dentistry involves placing fillings and crowns on teeth; 5)orthodontics involves movement of teeth into a comfortable and functional relationship with each other(we do not do orthodontics just to make an animal look better); 6) oral surgery involves treatment of fractures of the jaw and oral cavity, treatment of cancer and other oral conditions. In any one day, I might do some or all of the various treatments in animals. I might also take dental x-rays to help me diagnose or monitor a condition. I have always been interested in animals and medicine. After working as a general veterinarian for 15 years, I enjoyed making my patient's lives better by doing a good job keeping their oral cavities healthy. I wanted to do the very best I could, so pursued becoming board certified. 9. Anything else you'd like to share with young people about your career choices? The most important thing a young person should remember about a career choice is that it is something that you do most of your adult life. Therefore, it should be something that the student really enjoys and has a burning interest. 10. What kind of dental care should young people give to their pets?Etc. Young people should brush their pet's teeth daily. They can ask their veterinarian for advise about how to do this effectively and safely. 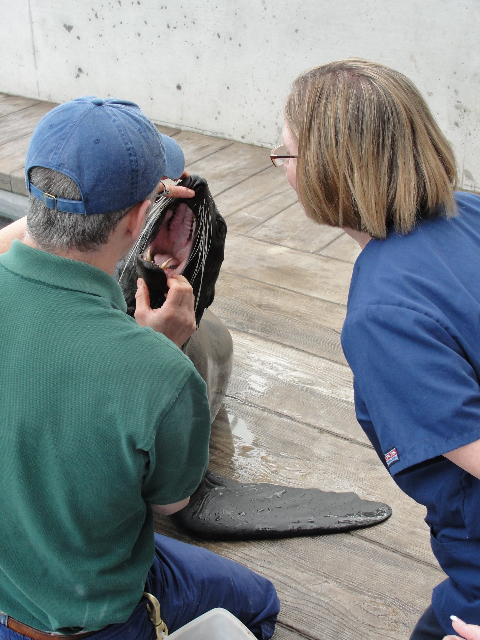 Dr. LeVan and her patient, a fur seal named Isaac! THANK YOU very much, Dr. LeVan for the great photographs!